Raising a child is a demanding job for any parent, especially when supportive resources seem to be elusive or nonexistent. For families whose children have special needs, the task can be even harder. 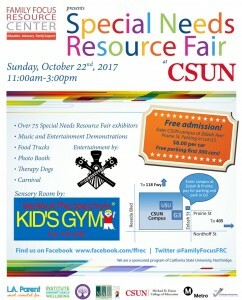 The Family Focus Resource Center at California State University, Northridge will host its annual Special Needs Resource Fair on Sunday, Oct. 22, to connect families with resources that can help their children thrive. The free event is scheduled to take place from 11 a.m. to 3 p.m. in CSUN’s University Student Union, located on the east side of the campus at 18111 Nordhoff St. in Northridge. The fair, one of the largest of its kind in Southern California, will feature more than 75 exhibitors that offer a variety of resources for various ages, abilities and needs. The event will include food trucks, a photo booth, therapy dogs, a carnival, music and other entertainment. Among the activities will be a sensory room sponsored by We Rock the Spectrum — an inclusive kids’ gym — and a performance by The Conductors, a train-themed band. The fair’s sponsors include the law firm Newman Aaronson Vanaman, which provides assistance to children with special needs and families whose members are disabled; We Rock the Spectrum Kid’s Gym, which provides sensory-safe play for kids with autism, special needs, and neurotypical development; the North Los Angeles County Regional Center; LA Metro; A Change in Trajectory, a center for autism assessment and behavior health treatment; and LA Parent. Parking for the University Student Union is located in the G3 parking structure, which can be accessed by entering Prairie Street from Zelzah Avenue. Free parking is available for the first 300 cars. For others, parking passes are $8 and can be purchased at machines within the parking structure or pre-purchased online at The Permit Store. For more than a decade, CSUN’s Family Focus Resource Center, housed in the Michael D. Eisner College of Education, has provided parent-to-parent support, education and information to parents and caregivers of children with special needs and the professionals who serve them. For more information about the Special Needs Resource Fair and for a full list of the exhibitors, call the Family Focus Resource Center at (818) 677-6854 or visit the its website.